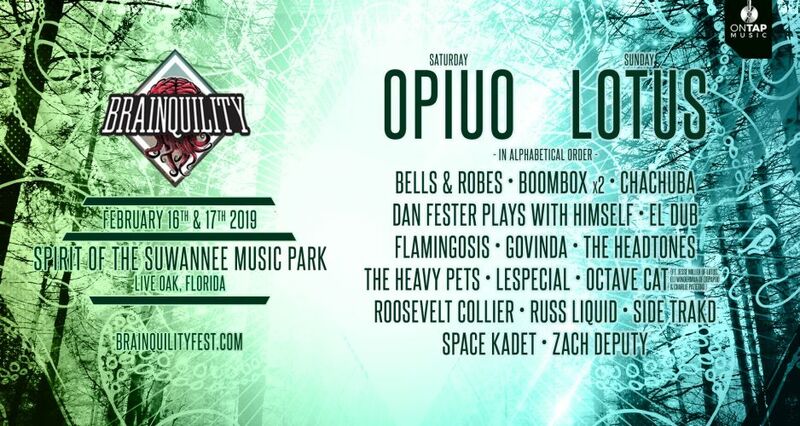 We had the chance to chat with one of the founders of Brainquility Music Festival, Chris Paolella, who is gearing up for the festival's second edition happening February 16th-17th at The Spirit of Suwannee Music Park in Live Oak, Florida. This festival is focused on much more than solely music. It's an experience like no other that brings in various art forms and a draws in special crowd focused on community and acceptance. Attendees are able to enjoy all that the festival has to offer at its beautiful new home equipped with camping features amongst the massive trees and peaceful river. It's truly a one of a kind. Tickets are still on sale now here! Could you give us a brief rundown of how Brainquility came to be and how it differentiates from other festivals? Brainquility started as a idea between friends that wanted change the commercial ways festivals are executed. We dreamed to create a festival that focused on live music and a different experience interactive workshops allow attendees to create pieces of art with instructors and take home as a keepsake, such as a painting from the guided painting classes and a glass pendent is created on a torch in the glass working workshop. If hands on isn’t for you we also have a mid eastern dance and yoga class. Another addition from last year is the added games and tournaments. this year we have a Zach Deputy Frisbee golf and a team scavenger hunt that is sure to take you all over the park. We aren't some huge company or rich promoters, just a few friends living the dream of having the festival the way we always wanted. What is your title and what would you say is your biggest responsibility for the festival? This will be the festival's first year at its new home. How would you describe The Spirit of Suwannee Music Park to someone who has never been there before? It is a really magical place, for my friends and I. Simply put we always call it “home”. Sos is a place of comfort and you create the adventure you want for each event / stay. Brainquility seems to have a lot of activities throughout the park. Could you tell us some more about these? Glassblowing: Live Glassworks shows by Zen Glass, which is located in St. Petersburg, FL. Guests will be able to experience glass blowing themselves and create a one of a kind pendant to keep forever at no extra cost to customer. Live woodworking: Attendees will be able to watch the Wood Wizard carve beautiful works of art before your eyes with chainsaws. Scavenger hunt: Groups of 4 can compete for prizes and tickets for Brainquility 2020. Participate in events and explore the festival grounds for ways to earn points. Art stage performance: Guests are encouraged to bring their instruments to jam on our art stage. You can play solo or with your friends. Maybe even score the chance to jam with one of the artists. Zach Deputy Disc Golf Tournament: Bring your discs and huck some plastic with Zach Deputy. Test your skills for the chance to win awesome prizes. On-site Merch printing: We will be doing all merch on site so you can see it all be made live. Face painting: Free face painting will be available for kids and adults for free. Painting: Follow along with a guide and paint your own piece of art. There will be two scheduled classes each day. Are there any particular artists on the lineup that you're excited to catch yourself? Boombox for years has been one of my favorite groups and rarely come close to Florida. I have always wanted a chance to see them, so naturally they were my first choice for booking. I was really happy to not only bring them to florida, but for them to play two sets. Aside from the location change, what's the biggest change that this year has? Our staff. We have had some great additions this year that have changed the dynamic and I really can’t wait to work with them next year. Learn more about Brainquility Music Festival here.